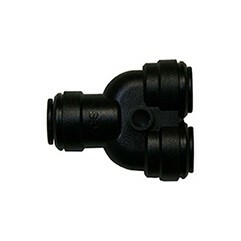 *This splitter connects to the output port of the Stainless Steel UV Chamber on our ULTRA-UC-DISINFECT Undercounter filter system, and allows you to connect both, the dedicated faucet and another 1/4" OD (outer diameter) plastic or copper line to the filter. This high-quality 2-way output splitter is designed specifically for use with our ULTRA-UC-DISINFECT system, allowing you to connect two separate output connections to the water filter at the same time. This is perfect for sending filtered water to the fridge/ice-maker so you may enjoy that extra cool, clean and naturally Alkaline PureEffect water and ice, or send the filtered water to a 2nd dedicated faucet on another floor of your home. Made of BPA & Phthalate-Free materials.